The M.o.B. | The "Modellers of Ballarat"
Vendors selling kits, bits and books. For over ten years MoB members have raised funds for Make-A-Wish Australia. 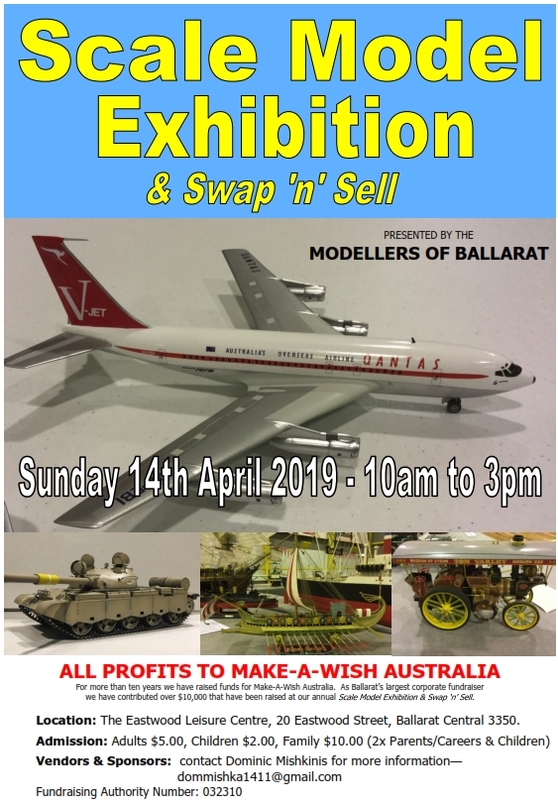 As Ballarat’s largest corporate fundraiser for Make-A-Wish our band of merry modellers has raised well over the $10,000 mark through our annual Scale Model Exhibition and Swap ‘n’ Sell show. Doing some long overdue maintenance to the site and I’ve uploaded the current 2019 newsletters to the site. As always our newsletters are provided in PDF format so you’ll need a reader to open the files. There are many, including those included in the better browsers, take your pick and enjoy. Sunday 22 April – Ballarat Central – Eastwood Centre. MoB Annual Show Day, supporting the Make-a-Wish foundation. All of our monies raised go to supporting this great charity. Come along to see great modelling and for the chance to win some lovely prizes too in the raffle. Great vendor support too with lots of lovely plastic on offer. See you there. It is that time again. This Saturday we’ll be meeting at the home of the MoB – the Eastwood Centre – Central Ballarat. In addition I’ve finished uploading the 2018 newsletters, including the current one if you have not received a copy from our Editor. I expect to see you there on Saturday, and hope to retrieve my hat from the hatnapper, and not have to hand over a million dollars. Otherwise, I’ll be adding a page for the collection of said Millions of dollars for the freedom of my hat. See you there. Originally published on my reading blog. Of interest to those on the MoB list. For the modeller and historian this book will provide great appeal. However, there are some issues with the photos and captions in the book that left me often perplexed and sometimes stumped. That aside though, there is a wealth of detail for the modeller especially with highly detailed photos of this particular WW2 panzer. The history of its development, deployment and upgrade, including timelines for upgrades and changes, make this a worthwhile purchase to those interested specifically in modelling the tank. The history included covers the political and army maneuverings as well as the industrial angle of the development. In all a thoroughly interesting and highly readable, accessible and useful book. September Model Maker now available online! September’s club Newsletter is now online. If you are a member and don’t have the password you can ask Dom at the meeting on Saturday night or contact me through this website, using the contact page.